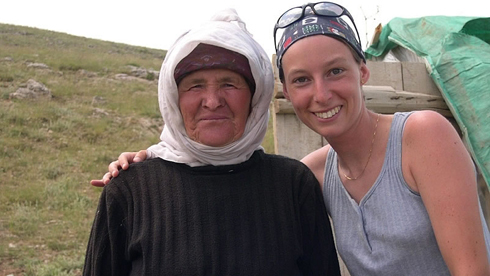 Featured in Equitrekking's Turkey TV episodes on PBS, CNNGo and as the cover story in the Albuquerque Journal magazine! Combine the adventure, history, culture and nature found in Cappadocia, Turkey with the bustling sights of exotic Istanbul on a variety of itineraries for riders and their non-riding companions with Kirkit Voyage. 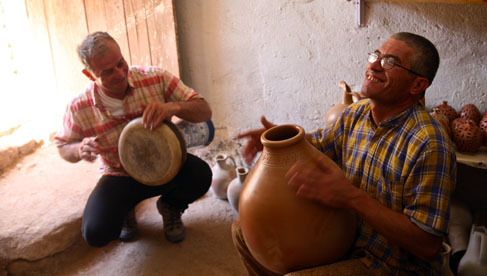 These Turkey riding vacations are filled with hidden gems and amazing historical sites. 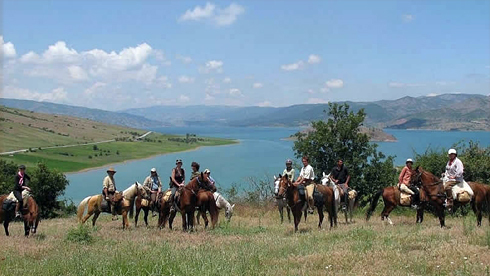 The Equitrekking team enjoyed horse riding with Kirkit Voyage, while filming two TV shows in Turkey for PBS. In ancient times the name Cappadocia meant “the land of beautiful horses” and the finest horses were raised in this region. Today, on your adventures Cappadocia horse riding, you’ll ride through ancient villages to meet welcoming local Turks and pass through valleys with stunning rock formations, called fairy chimneys. Over time the soft rocks have been sculpted by erosion from the elements, like wind and water, into shapes which can fuel the imagination and local legend. Be sure to ask about the local folklore surrounding these bizarre formations. On this Turkey riding vacation, mount Ride Arab and Barb horses through colorful canyons to old Silk Road Hotels, underground cities, hidden churches and historic villages. 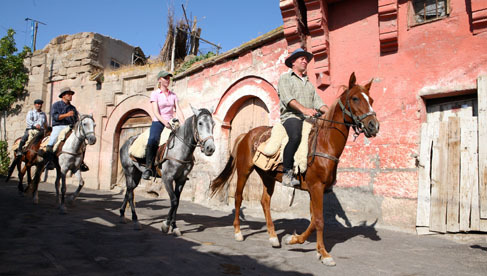 All of these amazing sights are in a compact area, so you can ride from village to village on horseback. 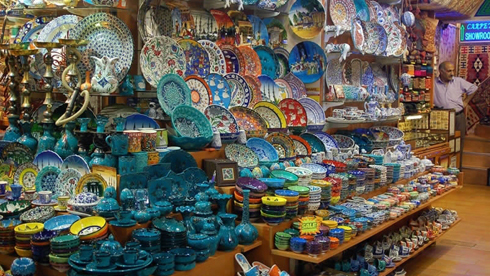 You’ll eat an abundance of good Turkish food, perhaps in a historic cave or outside in the courtyard. This trip is suitable for intermediate riders, who are comfortable at the walk, trot and canter and riding on and off trails for many hours. Please let us know if you have a non-riding companion. Kirkit Voyage is happy to arrange additional activities for them, like hiking, hot air balloon rides, mountain biking, canoeing and visits to many cultural sites. 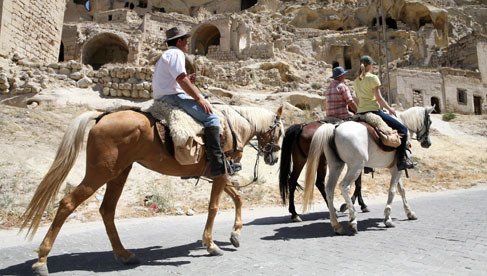 History and exotic culture abound on Cappadocia horseback riding tours! 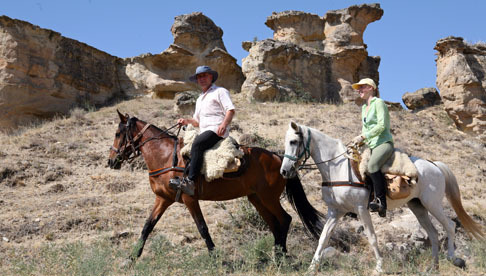 Choose from a variety of Cappadocia Riding Holiday Itineraries, including short rides, multi-day riding vacations and plenty to do for your non-riding companions. Itineraries can be customized to fit your needs. B & B’s with private ensuite bathrooms or camping, depending on the trip that you choose. 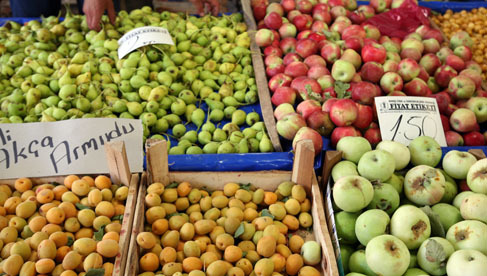 The food in Turkey is fresh, tasty and abundant. Vegetartian options are available. 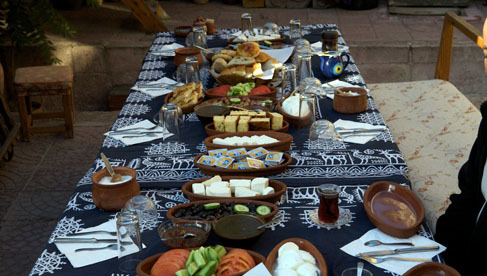 Sample breakfast: Piping hot Turkish tea, coffee, bread, butter, olives, tomatoes, feta cheese, honey, local jams and specialties and sometimes eggs. Big sandwich with tuna, chicken or cheese, sometimes with a cucumber or tomato, juice, chocolate bar and a slice of cake. Traditional homemade meals might include soup, vegetables in sauces, some meat or chicken, various salads, yogurt, dessert or fruit. Tea in abundance. Alcohol is available, but not included. 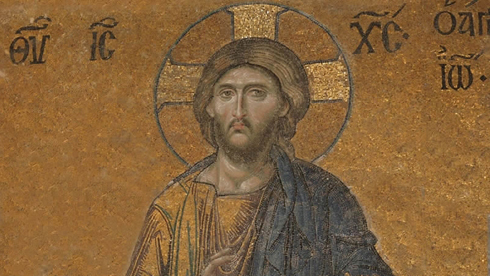 Tour the top sites in Istanbul and Cappadocia in Central Turkey. Non riders might enjoy our other area activities including hiking, hot air balloon rides, mountain biking, canoeing and a visit to see the whirling dervish ceremony. 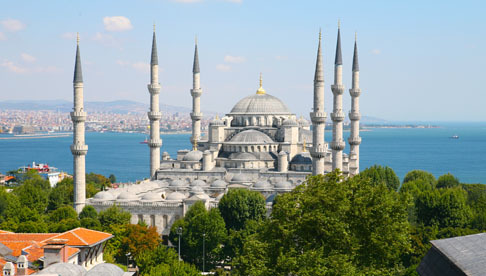 Riding holidays to ancient villages and through the exotic fairy chimneys of Cappadocia in Central Turkey with a city break to see the top sights of bustling Istanbul. 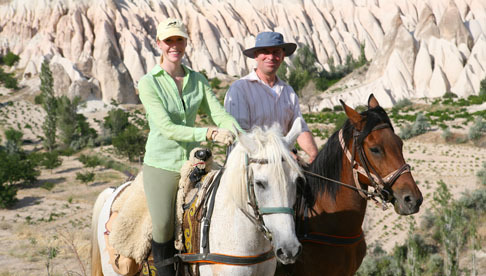 These Cappadocia riding holidays take travelers through Cappadocia in Central Turkey with optional excursions to Istanbul. The weather is nicest May to June and September until mid-October. See Kirkit Voyage's website for the latest rates, dates and itineraires.